The France was the largest ship built for the French Line at that time and the first to be powered by steam turbines. 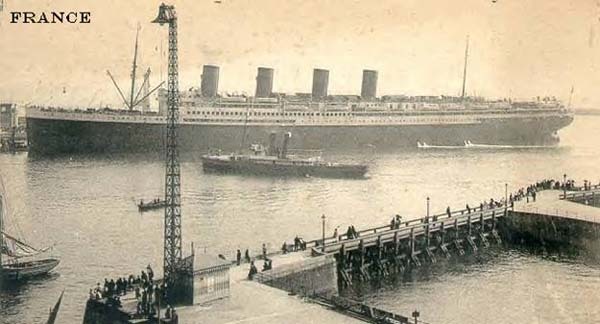 Although the French Line were not yet competing to build the largest ships, the France was one of the fastest liners in service at that time, only Cunards Lusitania and Mauretania were faster. Her maiden voyage from Le Havre - New York August 20th 1912 created a great amount of interest as her luxurious interiors had been designed in the style of Louis XIVs palace at Versailles. The France had to be put into Harland & Wolff in 1913 to have some design faults rectified. This work involved changes to her running gear to eliminate serious vibration problems and alterations to her hull as she rolled badly in heavy seas. The French Navy requisitioned the France at the outbreak of World War One in 1914 to serve as an auxiliary cruiser. The navy soon found she was unsuitable for that role as it took too much precious fuel to keep her operating. This led to the France being converted to a troopship in 1915 for transporting Allied troops to the war in Turkey (Dardanelle's Campaign). As the number of casualties in that campaign continued to rise over the following months, she had to serve temporarily as a hospital ship. America’s involvement in World War One from April 1917 saw her used to transport US troops to the war in Europe. The might of the US forces helped bring the war to an end in November 1918, this allowing the France to re-enter service on the Le Havre - New York run soon after. The emergence of the French Lines 43,153-ton Ile de France on the Atlantic run in 1927 led to the France being operated as a full time cruises ship. With her being unable to run at a profit as a cruise ship on Mediterranean and West Indies routes over the following five years, she was withdrawn from service in 1932. The French Line laid the France up at Le Havre until she set out for the scrap yard at Dunkirk April 15th 1935.